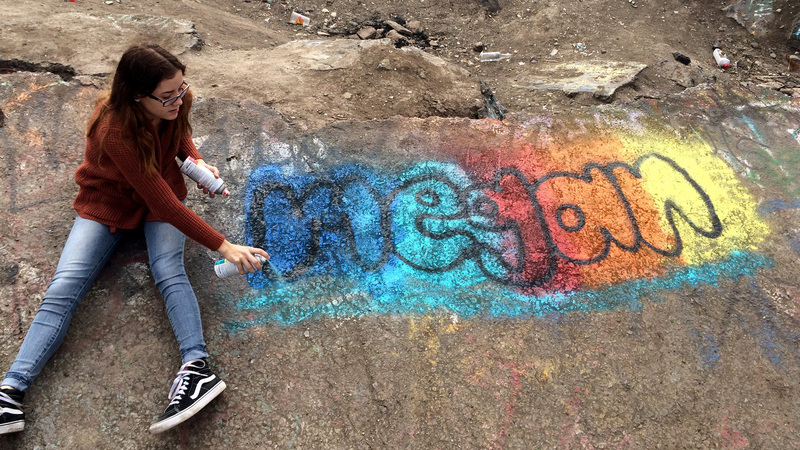 Spray Paint your name in Bubble Letters, 2 colors. Alana (Amanda’s niece) & Amanda sitting on top of Amanda’s name! You can paint anywhere that’s legal! A piece of cardboard or plywood in your backyard is great. Occasionally someone’s parents will let them paint their garage door or backyard wall. 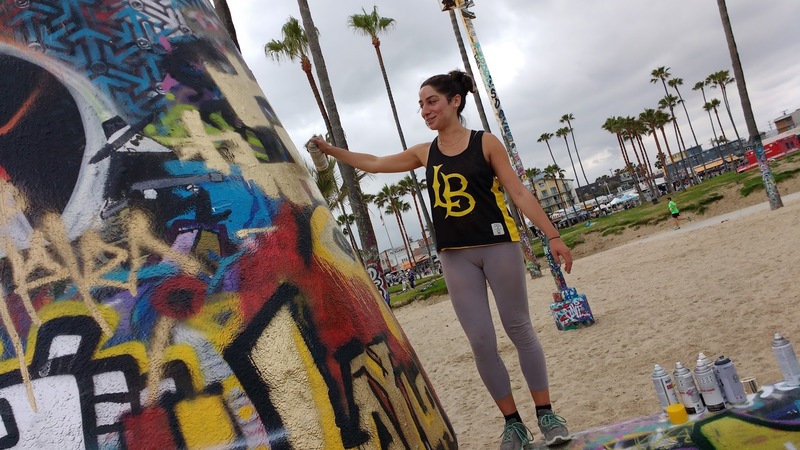 Eclectic mix from rich & famous artists (Digital Domain, Chiat Day, Frank Gehry, Claes Oldenburg, Jonathan Borofsky, Mark DiSuvero) to starving artists selling paintings on the Venice Boardwalk for $5! If you do go out to Venice, there’s a little EC you can do while you’re there. You can visit Small World Books just across the boardwalk from the Venice Art Walls. You can also visit LA Louvre art gallery (Art Gallery open Saturday, closed Sunday). Also, since so many of you have skateboards, you might like to know that the Venice Skate Park is right next to the Art Walls! I’ll give you EC for a photo of you skating in the Venice Skate Park! +10 EC for a photo of you holding a zine at the Zine Rack at the entrance to Small World Books. Just add this photo to your Graffiti Writing activity post. +15 EC for doing beach cleanup. This one is from your awesome classmates Sierra & Julia. While you’re at Venice Beach, bring along a medium sized bag. Wander around and fill it with trash. Include a photo of you holding your bag full of trash with your blog post. Build a better world, score points while you’re at it! +30 EC for a blog post of your visit to LA Louvre gallery. Be sure one of your photos is of you in the gallery! And parking. Street parking is free if you’re willing to walk enough blocks. Or $15 to park super-close. And food if you’re hungry. Kettle Corn, Cheep Pizza, Poke Bowls, etc. The Art Walls are CLOSED WEEKDAYS! The Art Walls are Open Saturday & Sunday 10 am – 5 pm. Whether you go to Venice or not, be sure your blog post includes a clear photo of YOU with YOUR WORK. Free: On the street, far, walk! Even if you don’t have a car… half the class or more does! 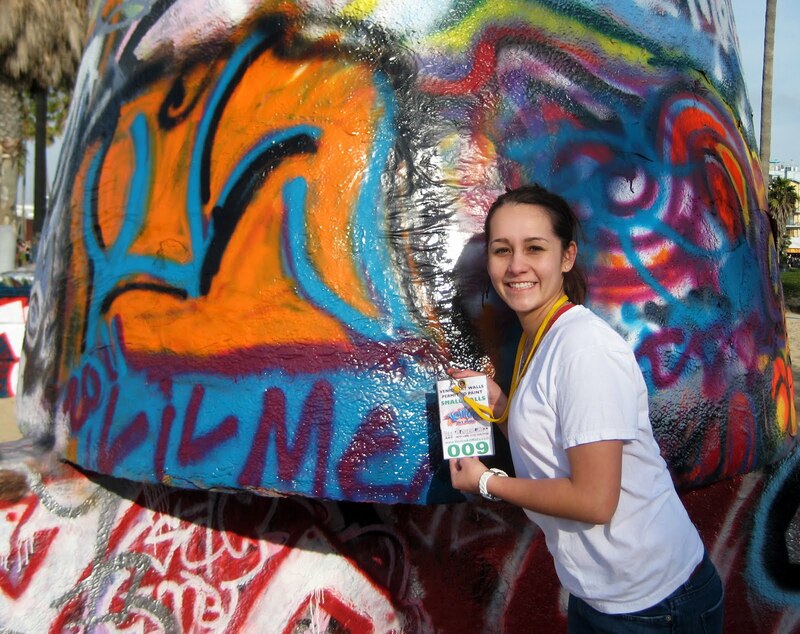 Share a ride and share paint! I will be there on Saturday from 11a to 2p. You really don’t need any help from me, but it’d be nice to say “Hi!” and hangout. Do a Pencil Sketch of your name in Bubble Letters in advance. Blog it! Include a few pictures and talk about your experience. Be sure your blog post includes a clear photo of YOU with YOUR WORK. BTW: you have more paint than you’ll need to just do your name. Have fun! Paint other stuff too! Going home with extra paint is lame. Use. It. All. Lil Mex (Jessica Harrington) with her Venice Artwall Painting Permit in 2011. You used to have to show ID and fill out a form to get a permit. It seems like lately you just show up and paint. You should still ONLY paint on Sat & Sun. And even though you’ll see paint all over the trees, you should only paint on the Art WALLS. Have fun!